As I discussed in my previous essay Approaching the Question, many of us were taught to cling to certain beliefs by people we trusted. Using the examples of Santa Claus and slavery, I tried to demonstrate ways a person might seek to defend his own deeply-held beliefs. That eagerness to defend our own position can have a significant impact on how we view new evidence. We can come up with seemingly valid reasons to hold onto those beliefs we were taught by people we trusted. However, just because we can produce evidence that supports our position doesn't mean that position is true. A thorough analysis is often required, especially in situations where we bring to the discussion a long-held opinion on the matter. In this essay, I will examine Scripture on the topic of the fate of unbelievers. I will weigh, as on a scale, those verses for each position. My hope is that this approach will lay out in the open the most significant pieces of evidence on this topic, and will you give you the opportunity to view clearly what Scripture says. In placing verses into categories, I initially tried to treat each verse independently. I approached each verse with this question in mind, "If this were the only verse I read on this topic, which position would I consider it to support?" Only after considering each verse on its own did I step back and look at the broad picture. My hope was to accurately assess what the Bible said without being impacted by previously held beliefs. I must emphasize the importance of properly understanding the context of any Biblical verse. In presenting this diagram, I am not implying this approach as a final word on the matter. For each verse above, the proper context must be understood. In presenting this diagram, I want to save you the effort of finding these verses yourself, but I don't want to save you the effort of reading these verses yourself. To truly understand and internalize the message of Scripture, you must do the work to read and understand the context of what is being said. In reviewing this list, the most surprising thing for me was the number of passages in the Bible that explicitly state that unbelievers will suffer 'destruction' or will be 'destroyed'. In my opinion, the most natural meaning to take from such passages is that the unbeliever would cease to exist. This understanding is reinforced by multiple illustrations that depict unbelievers as things like chaff, weeds, dried sticks, salt and bad fish. In each of these illustrations, the object depicted is discarded, not tormented. It was curious to me that these explicit statements and clear illustrations had gone largely unnoticed by me through all the period of my life where I believed in eternal torment. I was also surprised at the number of verses that seem to indicate that all men will eventually be reconciled to God. That may seem like a strange concept, but the evidence is there for you to examine. Again, please make sure that you are understanding the context of these verses. I don't want you to take my word for what is in Scripture, but to closely examine the evidence yourself. One fear I have in creating this website is that some might interpret me to be diminishing the damage caused by, and the severity of, sin. That is the last thing I want to do. Sin is the opposite of all that is good, of God's very nature, and of all that is our own self interest. It is terrible and must be exposed for what it is. Sin cannot exist in the presence of God. Sin is what led Christ to dies on the cross. I would never want to diminish the significance of that truth. A related fear I have is that some might suppose I am diminishing the work of Christ on the cross. I would never want to do such a thing. I fully believe that Christ's death on the cross and resurrection is the only way any man could be allowed into heaven. I also fully believe that each man must recognize and repent from his own sin in order to take advantage of Christ's death on the cross. That is why I named the category above "Universal Repentance". Some call this position "Universal Salvation". I understand why they use that term, but that term doesn't explicitly express the idea that repentance is required of all men. God will not compromise and will not overlook sin. The only way I would ever even consider the possibility that all men might one day be with God is by suggesting that they might one day be given the opportunity, and take advantage of the opportunity, to totally repudiate their own wickedness and ask God for his mercy. I am currently undecided on what I believe, whether God will annihilate unbelievers, or whether all men will some day repent. In this website, I will not examine in detail those two positions except in the sense that they are alternatives to the idea of eternal torment. As I have said, my primary goal in this website is to dispel the notion of eternal torment, and I will do that by revealing how little support that position receives in Scripture. Let's look at these verses in more detail now. Given the many verses that are translated into English as 'destruction' or 'perishing' , the meaning of the Greek words behind those translations become very important. Do those words mean 'cessation of existence', or do they mean something else? Let's look more closely at these words. From just the definitions above, we can't conclude with confidence exactly what the writers of the New Testament meant when using those words. The cessation of existence is certainly one valid meaning, but these words can also express meanings that are not quite so drastic, such as 'ruin'. The chart confirms that these words can have a variety of meanings. They can mean 'physical death', they can mean 'loss', they can mean 'waste', they can mean 'ruined'. Some of these uses imply that the object 'destroyed' ceases to exist entirely, while others imply that the object continues to exist, only in a ruined or lesser state. How can we get a better idea of what the author intended when using these words to describe the eternal fate of the unbeliever? To answer this question, a couple of considerations should be addressed. First is the fact that no word existed in the Greek language that expressed the idea of 'cessation of existence' more strongly than the ones considered above. That is an important point. If the writers of the New Testament wanted to express the cessation of existence, these are the words they would have used. In English, we have words like 'annihilation', 'obliteration', and 'extinction' available to us. These words leave little doubt that the object acted upon truly ceases to exist, but each of these words are of Latin origin and came in to use much later than the time of the New Testament writings. They were not available to the writers of the New Testament. If the writers of the New Testament intended express the annihilation of unbelievers, the words listed above were the right ones to use. We must also consider the illustrations and parables used by John the Baptist and by Jesus to express the eternal fate of unbelievers. In essentially every instance where they gave an illustration or parable of the judgment day, the object that signifies the unbeliever is totally destroyed. We have 'chaff' being burned in a fire, 'weeds' being burned in a fire and 'dried sticks' being burned in a fire. Any listener to one of those original lectures would have reasonably concluded that the unbelievers would be totally destroyed. John or Jesus could have talked about rocks being thrown into a fire, heating to red hot, but never being consumed. Or they could have given us an illustration of men being thrown into a jail from which they will never be released. None of these illustrations ever appear. And what about writings of Peter & Paul? Why did they never mention eternal torment? Consider the phrases used by modern speakers when talking about eternal torment. What you will consistently find among those who believe in eternal torment is the use of words like ‘never-ending torment’, ‘eternal conscious torment’ and ‘eternal separation from God’. We don’t find these same phrases in the writings of Peter & Paul. Not once in all of their writings do they use Greek equivalents of the phrases ‘never-ending torment’, ‘eternal conscious torment’ or ‘eternal separation from God’. Essentially every time Peter or Paul described the fate of the unbeliever, he used words that express as strongly as possible that these people will cease to exist. In any one of these places, they could quite easily have expressed a belief in eternal separation, or eternal torment. To illustrate this point more explicitly, I've created the table below. 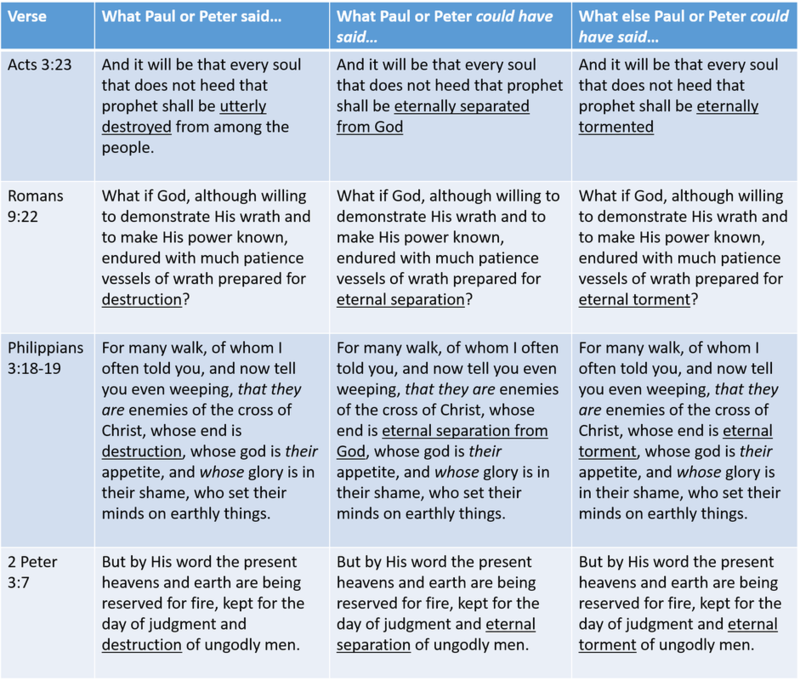 I've listed just four of the many instances where Peter or Paul chose to describe the destruction of unbelievers. The first column shows what Peter or Paul actually wrote. The second and third column illustrate what we might have expected them to say if they believed in eternal separation from God, or eternal torment. If Peter & Paul believed in eternal separation from God, then why didn't they ever say so? Why not just once? If they believed in eternal torment, why didn't they say that? Why not just once? Why is it that every chance they had to express the eternal fate of unbelievers, they chose to express the idea of destruction? The answer to me is obvious - because that is what they believed. Not eternal torment, not eternal separation from God, but a destruction that will end the existence of the person destroyed. In this illustration, I indicate verses which should be moved to a different category upon deeper investigation. I've assigned letters to those various verses and will elaborate on my reasoning in the lettered sections below. "Then they will go forth and look On the corpses of the men Who have transgressed against Me. For their worm will not die And their fire will not be quenched; And they will be an abhorrence to all mankind." Because this verse says "their worm will not die" and "their fire will not be quenched", some have concluded that this verse refers to an everlasting torment. However, that clearly is not the case. In this verse, Isaiah is surveying the result of a battle and is looking at corpses. These corpses are not conscious. They are not being tormented by worms nor do they feel the pain of being burned. The men that used to inhabit these corpses are dead and will never regain consciousness. Even if this verse were taken to be an illustration of spiritual and eternal truths, we would not conclude that souls will be tormented forever. We would conclude that souls will be destroyed, because the bodies are being destroyed. This verse either says nothing about the eternal fate of unbelievers, or it says that unbelievers will be ultimately destroyed. At a minimum, it should be moved to the Neutral category. An initial reading of this verse might lead one to believe that some people will be resurrected to face an eternally conscious & shameful existence. However, that reading is not accurate because of the word translated as 'contempt' in this passage. 'Contempt' is something that exists in the one feeling the emotion and not in the one to whom that emotion is targeted. In fact, I could feel contempt for someone who no longer exists. For example, if you asked 10 Americans if they feel contempt for Adolf Hitler, I suspect all 10 of them would say 'yes', even though Adolf Hitler no longer exists in this physical world. In the same way, I believe it is fully possible that believers in heaven will eternally feel contempt for those who chose to deny God's offer of salvation, even long after those unbelievers have ceased to exist. To reinforce this point, it should be noted that the word 'everlasting' applies only to the word 'contempt' and not the word 'disgrace'. A careful reading, therefore, would lead us to believe that the disgrace will not be everlasting. This verse should also be moved to the Neutral category because it says nothing about how long the disgrace of unbelievers will last. Both John the Baptist and Jesus refer to an 'unquenchable fire', or 'a fire that will not be quenched'. Traditional interpretations claim that they are referring to a fire that burns forever. However, that is just not true. To quench a fire means to put out a fire. Just because nobody puts out a fire, that doesn't mean it will burn forever. I have a fireplace at home and often burn a fire in the winter. Almost every time I do so, I create 'a fire that will not be quenched'. That sounds dramatic, but it's absolutely true - because I let the fire burn until it burns out. I don't quench it. Similarly, when referring to an 'unquenchable fire', biblical writers are referring to a fire that is so hot that can't be quenched by men. One might say that the great Chicago fire was an 'unquenchable fire', but that doesn't mean it burned forever. For comparison, consider these verses from the Old Testament that uses the word 'quenched'. In almost every situation, the writer is describing a fire that consumes that which it burns. In those verses, the use of this phrase implies total destruction, not eternal torment. Verses that allude to the Old Testament passages of 'unquenchable fire' are alluding to the concept of total destruction and so should be moved to the category of Annihilation. This phrase 'weeping and gnashing of teeth' is used in multiple places in the New Testament and is clearly applied to the torments of hell. However, there is nothing in any of these verses to indicate that this 'weeping and gnashing of teeth' will go on forever. This could easily be understood to mean the anguish felt by unbelievers when they realize that they will not be entering paradise and will be destroyed forever. Psalms 112 The man who fears the LORD ... has given freely to the poor, His righteousness endures forever; His horn will be exalted in honor. The wicked will see it and be vexed, He will gnash his teeth and melt away; The desire of the wicked will perish. I suspect this is the verse that Jesus was referencing when he used the word 'gnash', because this is the only place in the Old Testament where this word was used in the context of a judgment day. In this verse, the wicked man is gnashing his teeth because he sees the rewards being given to the righteous man. He is not gnashing his teeth because he is being afflicted with some type of torment. Those places where we read the phrase 'weeping and gnashing of teeth' tell us nothing about how long this will take place, nor is it necessarily an indication that the person is being actively tormented. Those verses should be moved to the Neutral category. My initial reading of this passage was that the unrighteous will suffer eternal conscious punishment. Why did I initially read it that way? One reason is because punishment in this life almost always includes the infliction of pain. Whether that punishment be a physical lashing, or a financial penalty, or imprisonment, punishment almost always includes some form of pain or discomfort for the person being punished. Because of this, we naturally think of the infliction of pain when we the word punishment. But punishment doesn't always include the infliction of pain. The clear example to the contrary is capital punishment. In capital punishment, the punishment is the deprivation of life. Nobody would suggest that the justice of capital punishment is accomplished by inflicting those few moments of pain that come while a person is being killed. The punishment is the loss of life itself. Now, if we were to tally all of the forms of punishment that were inflicted throughout the entire world yesterday, what percentage of those punishments would be capital punishment? If we consider all of the traffic fines, the school detentions, the jailings, etc. I'm sure that far less than 1% of the punishments inflicted yesterday were capital in nature. Punishments normally entail an event of some duration that take some amount of time, and so that is what we naturally think of when we read the word punishment. But that natural inclination doesn't invalidate the truth that punishment can also mean something else. It is very possible that Jesus was referring to a punishment that did not consist of the infliction of pain. Hebrews 6:1-2 Therefore leaving the elementary teaching about the Christ, let us press on to maturity, not laying again a foundation of repentance from dead works and of faith toward God, of instruction about washings and laying on of hands, and the resurrection of the dead and eternal judgment. Hebrews 9:12 and not through the blood of goats and calves, but through His own blood, He entered the holy place once for all, having obtained eternal redemption. eternal salvation does not mean a process of saving that never ends, it means a single act of salvation that has eternal consequences. eternal judgment does not mean a process of judging that never ends, it means a single act of judgment that has eternal consequences. eternal redemption does not mean a process of redeeming that never ends, it means a single act of redemption that has eternal consequences. eternal punishment does not mean a process of punishing that never ends, it means a single act of punishment that has eternal consequences. We are not forced to conclude that God will be punishing for all eternity. Jesus does not in this passage give a clear indication of what the punishment is. In effect, it could be an 'eternal capital punishment' - that is, a capital punishment with eternal consequences. In other passages, he does give an indication of what the punishment will be, when he talks about weeds being burned up in a fire, dried sticks being burned up in the fire, or fish being discarded. In this passage, he does not indicate the nature of the punishment. He only says that it will be eternal in its consequences. There is nothing in this passage that tells us the nature of this punishment - only the fact that its consequences will be eternal. This verse should be moved to the Neutral category. The parable of the Rich Man and Lazarus might appear to give support the notion of eternal torment, but it does not. For one thing, this is just a parable. In fact, it is similar to a parable in existence prior to the time of Jesus. Jesus appears to be modifying a parable initially employed by the Pharisees to make his point. We should be careful not to make a literal interpretation when Jesus did not intend it. But more importantly, the location of the Rich Man in this parable was in Hades, not in the lake of fire (often described as Gehenna by Jesus). This parable, even when taken literally, is not describing an eternal fate for the Rich Man. We know this because we read in Revelation 20:14 "Then death and Hades were thrown into the lake of fire. This is the second death, the lake of fire." Hades is clearly not the same as the lake of fire, so this parable does not tell anything about the eternal fate of unbelievers and should be moved to the Neutral category. In both 2 Peter and in Jude we read about angels being held in dungeons. It might initially seem to describe a place of everlasting torment, but it does not. In both instances, the angels are reported as being held for the the day of judgment. Any reference to eternal refers to the past tense, not the future. These verses do not describe places of eternal torment and so should be moved to the Neutral category. Give that this verse includes the phrase 'eternal fire', some have concluded that this verse describes unbelievers eternally existing in a fire that never goes out. However, this verse does not say that. First, the word translated as 'eternal' is the Greek word aionios. From this word, we get the English word eon, as in a long age. In Scripture, this word sometimes means eternal, but not always. Often, it means 'pertaining to the age to come'. In this case, the verse could be translated to mean they will be 'punished with fire in the age to come'. Supporting this notion is the first part of the verse. Were the inhabitants of Sodom and Gomorrah punished with a tormenting fire, or were they totally destroyed? Clearly, they were totally destroyed and not tormented with fire, although I suspect they felt some pain as they were being destroyed. Given that these inhabitants are presented as an example of what will happen to unbelievers at the judgment day, this verse should actually be moved to the category of Annihilation. Then another angel, a third one, followed them, saying with a loud voice, "If anyone worships the beast and his image, and receives a mark on his forehead or on his hand, he also will drink of the wine of the wrath of God, which is mixed in full strength in the cup of His anger; and he will be tormented with fire and brimstone in the presence of the holy angels and in the presence of the Lamb. And the smoke of their torment goes up forever and ever; they have no rest day and night, those who worship the beast and his image, and whoever receives the mark of his name." For many years, I considered this verse to be one of the verses that most powerfully supported the argument for eternal torment. It seems to very clearly express the eternal torment of those thrown into the lake of fire. However, a deeper investigation produced in me a total reversal of my understanding of this passage, so that I now move it all the way over to the category of Annihilation. To explain why my understanding changed so dramatically, we need to examine closely this phrase, 'smoke rises forever'. As part of my examination, I would ask you to consider a different phrase that we use in English, the phrase "Another one bites the dust". We know what it means: it is a pronouncement that another person just died or was defeated. It does not mean that someone stooped down to take a bite out of the ground. The intended meaning is far different than what is literally expressed. If, 2000 years from now, a translator from another planet is trying to determine the meaning of the Queen song by that same name, what would he conclude? He would probably quickly conclude that the literal meaning is not correct, and would then try to find other uses of that same phrase. In doing so, he could piece together a meaning that makes sense. Isa 34:8-10 For the LORD has a day of vengeance, A year of recompense for the cause of Zion. Its streams will be turned into pitch, And its loose earth into brimstone, And its land will become burning pitch. It will not be quenched night or day; Its smoke will go up forever. From generation to generation it will be desolate; None will pass through it forever and ever. In this passage, Isaiah is describing the total destruction of Edom. As part of that description, he says that the "its smoke will go up forever". But pelican and hedgehog will possess it, And owl and raven will dwell in it; And He will stretch over it the line of desolation And the plumb line of emptiness. How could those animals possess it if it is still burning and smoking? Obviously, they couldn't. So, we must conclude that Isaiah meant that the fire will burn for a very long time, continuing to smoke until everything is totally destroyed. Eventually, the fires will go out and animals will move in, but the nation of Edom will never recover from this destruction. In regards to the physical conditions that Isaiah describes, this passages clearly teaches the total physical destruction of Edom and that Edom will never physically return. When applying this passage to a spiritual realm, we should then make parallel conclusions about the spiritual realm to which we apply it. Now, to get back to the Revelations passage about Babylon, it is clearly depicted that Babylon will be totally destroyed, just like Edom in the Isaiah passage. It therefore becomes easy to consider the angels' words in Revelation as a pronouncement of the total defeat of Babylon. Their assertion 'Hallelujah, HER SMOKE RISES FOREVER' is similar to how we might say, "Hallelujah, another one bites the dust!" That is, it is a pronouncement of the total destruction of Babylon, with a very clear allusion to the language of Isaiah. Given those two examples as precedence for the use of the concept of 'smoke rising forever', it seems very likely that the third instance where this phrase is used, in reference to people in the lake of fire, is intended to once again express the concept of total destruction. Hold that thought for a minute. Now look close at the tense of the verbs in this passage. Notice that the verb tense changes from present, to future, and then back to present. Why do the verbs change tense like that? The obvious answer is that the angel starts out talking about the present, then talks about the future, then returns to talking about the present. Then another angel, a third one, followed them, saying with a loud voice, "If anyone worships the beast and his image, and receives a mark on his forehead or on his hand, he also will drink of the wine of the wrath of God, which is mixed in full strength in the cup of His anger; and he will be tormented with fire and brimstone in the presence of the holy angels and in the presence of the Lamb. They have no rest day and night, those who worship the beast and his image, and whoever receives the mark of his name." This now reads in a way that is very similar to the passage in Revelation 19 concerning Babylon. With this structure, my reading is that the angel first foretells the fate that will befall those who currently worship the beast. Then, the angel breaks into a pronouncement of their upcoming total destruction. Finally, the angel changes back to the present tense, asserting that unbelievers currently have no rest night and day (on this earth) because of the fate that awaits them. Given the precedent established by the only two other instances in the Bible where the concept of 'smoke rising forever' is used, this passage clearly indicates to me that those thrown into the lake of fire will be totally destroyed. Because of that, I have moved this verse to the category of Annihilation. Blessed are those who wash their robes, so that they may have the right to the tree of life, and may enter by the gates into the city. Outside are the dogs and the sorcerers and the immoral persons and the murderers and the idolaters, and everyone who loves and practices lying. This passage could be read to express the idea that wicked people will continue to exist even after the new city of God is established. However, it should be noticed that there is no verb in the Greek. The passage actually just reads as "Outside the dogs..." The absence of the verb decreases our confidence in knowing what was being expressed. Isaiah suggests that those who are saved will remember those who were destroyed but God, but at that point they are corpses and are no longer conscious. John makes no mention in this passage of torment or any other evidence of ongoing existence for those who are excluded from the city, so we are not forced to conclude that was his intent. This verse must be moved to the Neutral category. These results illustrate how very little evidence exists in Scripture for the notion that God will torment some men for eternity. In all of the Bible, this seems to be the one passage that asserts the notion of eternal torment. Even so, several considerations allow us to set aside our initial understanding of this passage. First, the book of Revelation is steeped in Old Testament imagery and symbolism. Many passages in Revelation are not to be taken literally, so we should be cautious before insisting that this passage was intended to express the idea of eternal torment. Second, in examining Revelation 14:11, I made the argument that the Greek word translated as 'forever and ever' does not always necessarily mean 'without end'. The phrase in Greek is literally translated as "to the ages of the ages". We are not forced to conclude that the torment described in this passage is truly without end. Third, some portions of Revelation portray the beast as an institution, rather than an individual. Obviously, institutions can't be eternally tormented, so it would seem strange to demand that this verse must be applying to conscious entities. Fourth, in Revelations 20:13, we read that "death and Hades were thrown into the lake of fire" Clearly, death and Hades are not entities that are capable of enduring torment. It seems much more likely to suppose that this verse indicates a final destruction of death and Hades, rather than ongoing existence. If death and Hades will cease to exist when thrown into the lake of fire, then it is natural to conclude that the same fate will await others that are thrown in as well. Dan 7:9-11 "I kept looking Until thrones were set up, And the Ancient of Days took His seat; His vesture was like white snow And the hair of His head like pure wool. His throne was ablaze with flames, Its wheels were a burning fire. A river of fire was flowing And coming out from before Him; Thousands upon thousands were attending Him, And myriads upon myriads were standing before Him; The court sat, And the books were opened.Then I kept looking because of the sound of the boastful words which the horn was speaking; I kept looking until the beast was slain, and its body was destroyed and given to the burning fire. Many Biblical scholars believe that many, if not most, of the images in the book of Revelation are allusions to similar images in the book of Daniel. If that is so, then the passage above gives a clear indication that the beast, whatever it is, will be totally destroyed, rather than live forever. Fifth, this verse mentions only three entities that will be tormented. Never once does Scripture say that any entity other than these three will suffer eternal torment. So even if you ignore my previous four points and insist that this passage be taken literally, all you have is an assertion about three entities. Some might argue that if these three entities suffer eternal torment, then others thrown into the lake of fire must suffer the same thing. But that argument just doesn't stand up in light of the fact that death and Hades are thrown into the lake of fire. If the lake of fire destroys death and Hades, then it is reasonable to suppose that it destroys other things thrown in as well. Revelation if full of symbolism and that symbolism is not consistent and clear enough to make literal conclusions without supporting passages from other Scriptures. For those reasons given above, I do not take Revelations 20:10 to express the idea that unbelievers will be tormented without end. In summary, having looked at all verses pertaining to the fate of the unbeliever, and having done my best to determine exactly what was intended by the writer, the evidence in support of eternal torment is almost nonexistent. About the only question that remains is this: If Scripture has such little evidence in support of eternal torment, then why have so many people believed in it for so long? I will address that question in this essay.